from Vancouver, down the WA-OR coast, Redwoods, Napa Valley, San Francisco, Carmel, Big Sur, Hearst Castle, LA (Getty Museum, Anaheim, Balboa Island, Newport Beach), Palm Desert, Las Vegas, Hoover Dam, Sedona (AZ), Grand Canyon, Zion Canyon, Bryce Canyon, Escalante (Grand Staircase) with an eastern exit on Hwy 12 to drive the ‘Hogs Back Road’ to Torrey (UT), Provo-Salt Lake City, through Idaho, finish with Columbia Gorge, Portland, Seattle, and back to Vancouver (BC). 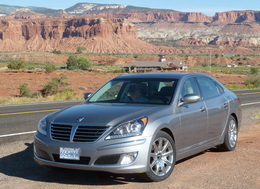 >>> Driving a new Equus – what an incredible journey! To view photos of this trip, visit WWB’s Gallery > http://www.wwb.ca/gallery and select the SW USA – 2011 – Album. This entry was posted on Saturday, October 15th, 2011 at 4:00 pm	and is filed under Reflections on Travel. You can follow any responses to this entry through the RSS 2.0 feed. You can leave a response, or trackback from your own site.